One of the largest recruiting events in the area is planned for next week, with more than 200 companies scheduled to arrive in Pittsburg with an eye toward finding students to fill positions across the U.S.
Called “Company Days,” the event is held in one of the most state-of-the-art learning environments in the region: the Kansas Technology Center. It’s hosted by the College of Technology, which is turning out graduates with expertise in a range of disciplines. On Tuesday, companies will focus on PSU’s Construction Management, Construction Engineering Technology, Environmental Safety Management, Interior Design, Graphics and Imaging Technologies, and Architectural Manufacturing Management and Technology programs. 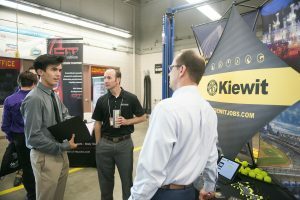 On Wednesday, companies will focus on PSU’s Automotive-Diesel Technology, Electronics Engineering Technology, Manufacturing Engineering Technology, Mechanical Engineering Technology, and Plastics Engineering Technology programs. Both days, the event will be held from 8:30 a.m. to 2 p.m. This year’s diverse line-up of companies ranges from locally-owned businesses like Jake’s Fireworks, CDL Electric, Miller’s, Leggett & Platt, Crossland, and Eagle Picher, to large, nationally-known companies further afield, like Caterpillar, General Motors, John Deere, Kiewit, Honeywell, Black & Veatch, Burns & McDonnell, and Ford Motor. Faculty encourage their students to use the event to begin exploring possibilities that companies have to offer, and to build relationships and lay the groundwork by looking for internships. “It’s also a great opportunity for our students to polish their networking skills,” Iley said. From an economic standpoint, Blake Benson, who heads up the City of Pittsburg’s economic development and the Pittsburg Area Chamber of Commerce, said events like Company Days not only benefit students, they are a boon to the entire community. “…they’re not only filling hotel rooms, they’re filling them with business representatives that may be looking for new areas of expansion,” he said.